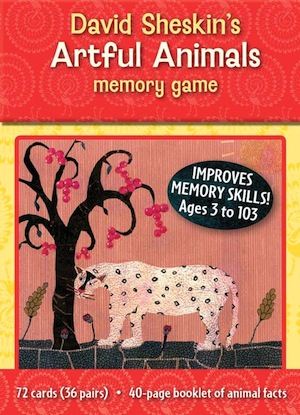 Presenting a colorful menagerie of David Sheskin’s whimsical animal images, this memory game presents 36 different animal cards for engaging play to be enjoyed again and again. Anteater, baboon, giraffe, hippo, cat, and dog—part of the fun is to identify the animals from the pictures alone. The accompanying booklet provides the name and some interesting facts about each creature. Sharpen your recall with this two or more player game. Each 2½" square card features an animal pictured in its natural habitat. Match pairs to win while enjoying the art work of David Sheskin. Instructions for play are printed on the bottom of the box.